Want to make your phone burn? Want to see raging fire on your screen? Fire Screen App Prank will make it. Just touch the screen or shout or blow to the phone. 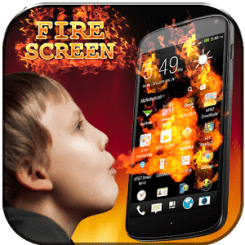 The realistic fire will burn on your screen and the burning cracking sound will start, your phone is burning with radiant flames, it's so cool! In the same time, Shout Fire Screen is wonderful fire live wallpaper. The fire will be generated when you touch the screen; they will burn in the background so you can use your phone as usual. ★Touch the screen to generate fire, flames. ★Blow to the microphone to generate fire. ★Realistic fire burning animation and sounds. ★The the size and the brightness of the fire will be changed according to the detected voice decibel.